While there is no magic pill on how to manage our increasingly busy lives, there are some common sense tactics that can help bring some modicum of control. 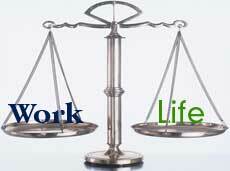 That’s why this short article, How to Balance Work and Life, caught our eye. There’s really nothing new here, just simple things we can do to get a grip such as making a list and prioritizing what’s important. Probably the most important is figuring out what makes a difference in our quality of life and responsibilities, and what in the long run doesn’t. It’s always about choices we make based on the circumstances of our lives.